LuxR light fittings are ingeniously crafted to harness the advantages of LED technology, incorporating a host of unique innovations to minimise energy use, reduce maintenance requirements and simplify installation. 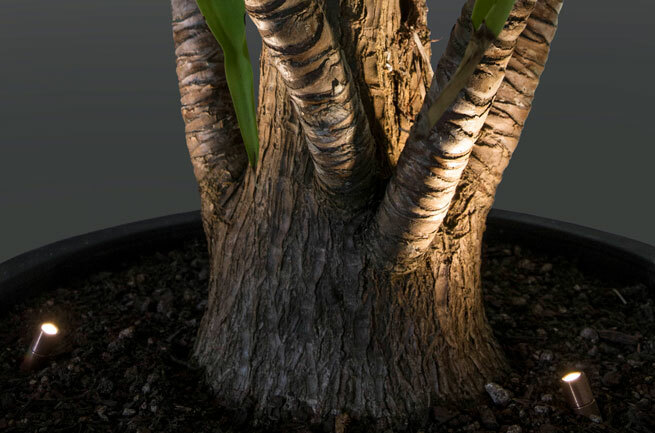 The aim was to create an outdoor luminaire product with a high IP-Rating that provides a soft and discrete light to illuminate the underside of foliage, small plants and trees. LEDiL STRADA and LISA optics were specifically chosen due to the size restraints of the products but they also gave us the possibility to create products that can be customized for different applications. LISA was chosen for the Micro Spot luminaire as it is ideal for illuminating small trees while STRADA-S was used for the Micro Diamond 180° and 360° luminaires for illuminating bushes and lower plants. By co-operating with LEDiL, AFC LIGHTING – OPTOLED were able to achieve street lighting that is both efficient and aesthetic to look at. The beautifully designed light poles next to the palm trees Using both styles of optics we were able to create a small pen like lighting fixture that almost disappears into any outdoor lighting situation whilst delivering a high level of lighting performance.